Talk about ugly teeth....expect it from this game. The most humorous looking people ever are here, as this is a Mah-jong/BOARD game. 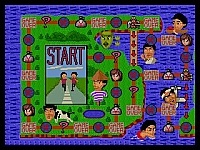 Right... just like a cross between Mahjong Kyoretsuden and THE GAME OF LIFE, this game is a good effort. However, it's too damn hard. 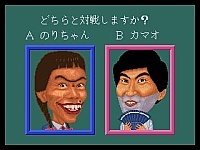 I'd play Bakatonosama before this one, but this is good, just for the funny-assed characters. Because this is a Japanese text only game and because I don't know the rules of Mah-jong, I cannot review it properly. If there are any Japanese-speaking people out there that could possibly give me a little info about this game, then please let me know! 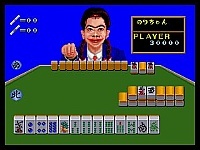 I don't know much about Mah-jong, but this game seems to be like all the rest that are available for the Neo Geo. I personally can't see anything that makes it stand out apart from some characters with HUGE teeth (! ), but if you are looking for a Mah-jong game and speak Japanese then this is a game that you will probably like. The graphics in this game are OK for its age (another early Neo game), but its a Mah-jong game, so don't expect anything brilliant. As far as the soundtrack goes, there is a bit of speech in this game and some annoying music, but that's about it. Average in the extreme. 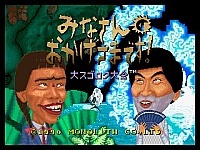 I can't really see anything that would make you want to get �Minnasan No Okagesamadesu� if you already have another Neo Geo Mah-jong game, or if you don't speak Japanese. Maybe I am missing something because I can't read the text?